Primo Blend is where East meets West. Where a heavily bodied and sweet Indonesian meets a floral and sweet American coffee. This simple blend is sweet, aromatic, rich and full-bodied and was designed to be your first cup of the day with the sole intention of openning sleepy eye-lids. 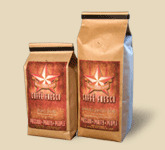 Primo Blend is Caffe Fresco SCR's breakfast blend. Have At It!